Cold War is the term used to describe the intense rivalry that developed after World War II between groups of Communist and non-Communist nations. On one side were the Union of Soviet Socialist Republics (U.S.S.R.) and its Communist allies, often referred to as the Eastern bloc. On the other side were the United States and its democratic allies, usually referred to as the Western bloc. The struggle was called the Cold War because it did not actually lead to fighting, or “hot” war, on a wide scale. The Cold War was characterized by mutual distrust, suspicion, and misunderstandings by both the United States and the Soviet Union, and their allies. At times, these conditions increased the likelihood of a third world war. 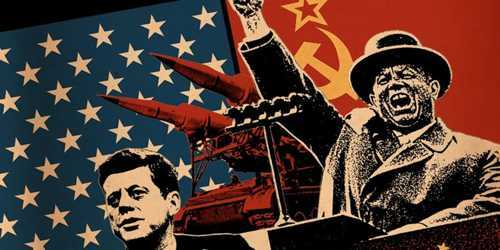 The United States accused the Soviet Union of seeking to expand Communism throughout the world. The Soviets, meanwhile, charged the United States with practicing imperialism and with attempting to stop revolutionary activity in other countries. Each bloc’s vision of the world also contributed to East-West tension. The United States wanted a world of independent nations based on democratic principles. The Soviet Union, however, attempted to tightly control areas it considered vital to its national interest, including much of Eastern Europe. Though the Cold War did not begin until the end of World War II, in 1945, relations between the United States and the Soviet Union had been strained since 1917. In that year, a revolution in Russia established a Communist dictatorship there. During the 1920’s and the 1930’s, the Soviets called for world revolution and the destruction of capitalism, which was the economic system of the United States. 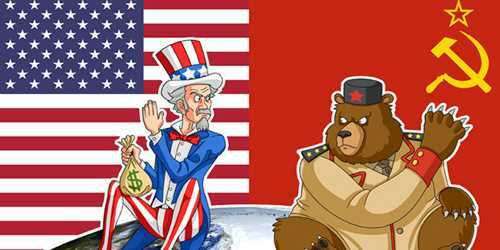 The United States did not grant diplomatic recognition to the Soviet Union until 1933. In 1941, during World War II, Germany attacked the Soviet Union. The Soviet Union then joined the Western Allies in fighting Germany. For a time early in 1945, it seemed possible that a lasting friendship might develop between the United States and the Soviet Union based on their wartime cooperation. However, major differences continued to exist between the two, particularly with regard to Eastern Europe. As a result of these differences, the United States adopted a “get tough” policy toward the Soviet Union after the war ended. The Soviets responded by accusing the United States and the other capitalist allies of the West of seeking to encircle the Soviet Union so they could eventually overthrow its Communist form of government. Two great blocs came into being. The United States led the Western bloc. By the early 1950’s, this group included the United Kingdom, Canada, France, West Germany, Japan, the Philippines, and many other countries of Western Europe and Latin America. The Soviet Union led the Eastern bloc, which included Albania, Bulgaria, Czechoslovakia, East Germany, Hungary, Poland, and Romania. China joined the Eastern bloc following the Communist take-over of its government in 1949. The nonaligned or neutral nations—those in neither bloc—included India, Indonesia, Cambodia, and most of the African states. During the late 1940’s and the 1950’s, the Cold War became increasingly tense. Each side accused the other of wanting to rule the world. Each side believed its political and economic systems were better than the other’s. Each strengthened its armed forces. Both sides viewed the Cold War as a dispute between right and wrong. They saw every revolt and every international incident as part of the Cold War. This situation made it difficult to settle any dispute peacefully through compromise, with each side giving up something. Fear grew among all peoples that a local conflict would touch off a third world war that might destroy humanity. The nature of the Cold War began to change in the 1960’s. Neither the East nor the West remained a monolith (united bloc). Communist China challenged Soviet leadership. China accused the Soviet Union of betraying Communism and being secretly allied with the United States. Some Communist countries followed China’s leadership, and others remained loyal to the U.S.S.R. Among the nations of the Western bloc, France harshly criticized many U.S. policies and demanded independent leadership in Europe. West Germany also acted independently of U.S. policies. It searched for new economic and political relationships with other European countries, including East Germany. Economic developments caused major shifts in the world balance of power during the 1960’s. The rapid industrialization of Japan and West Germany made them important nations in the struggle for power. Their emergence and the growing strength of China led to new relationships. In 1970, Soviet and West German leaders signed a treaty pledging peaceful relations between their nations. The long-disputed status of West Berlin was settled in 1971 when the United Kingdom, France, the Soviet Union, and the United States agreed that the city was not part of West Germany. But the four powers also provided for economic and political ties between West Berlin and West Germany. Also in 1971, China joined the United Nations (UN). The United States established diplomatic relations with China in 1979. Cold War tensions rose again after the Soviet Union invaded Afghanistan in 1979. Soviet leaders said the invasion was designed to help defend Afghanistan’s pro-Communist government from Afghan rebels. In the late 1980’s, however, Cold War tensions began to ease sharply after the signing of a major U.S.-Soviet arms-control agreement and after the U.S.S.R. removed its troops from Afghanistan. Tensions further decreased after major democratic reforms took place in Eastern Europe. In 1991, the Soviet Union broke up into a number of independent, non-Communist states. These reforms and other developments marked the end of the Cold War.